MeeGo support included in "Oak Trail" platform, Acer committed to MeeGo on upcoming netbooks. Intel's Computex press release highlighted it's "Canoe Lake" innovation platform, the proliferation and flexibility of the Atom franchise and the mobile dual-core Atom processor with DDR3 support for netbooks and entry-level PCs. But tucked into the press release were a couple of announcements about MeeGo, Nokia and Intel's jointly developed open source operating system. Starting in 2011, Intel's "Oak Trail" software on chip Atom platform will support MeeGo, in addition to Google's operating systems and Microsoft's Windows 7. "Oak Trail" promises to reduce average power consumption by 50 percent along with HD video support. In the same press release, Acer CEO Gianfranco Lanci committed to releasing netbooks with the MeeGo OS factory installed. "MeeGo's open software platform will present our customers with another choice of a friendly, easy-to-use operating system," Lanci said in the press release. 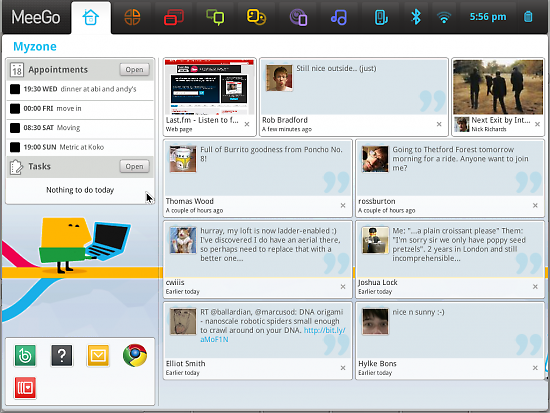 MeeGo 1.0 for netbooks was released last week. The platform is based on the 2.6.33 version of the Linux kernel. Open source mobile API based on Qt 4.6.2. Today the MeeGo project announced the release of MeeGo 1.2. "This release provides a solid baseline for device vendors and developers to start creating software for various device categories on Intel Atom and ARMv7 architectures," the announcement says. Imad Sousou, director of Intel's Open Source Technology Center, has released the first parts for developers of the Linux-based MeeGo platform for mobile devices. Who does what at the MeeGo project.